Pavers are a popular pool decking option as if they crack you have the ability to replace just one or two tiles rather than the whole deck. Pavers come in a large variety of materials including stone, brick, concrete, and aggregate, as well as various sizes, shapes, and colours, so it’s easy to find an option that suits your pool surrounds. They are also an eco-friendly choice, as they are set in sand rather than concrete, allowing for better drainage and less heat absorption. One downside of pavers is that they require a permanent border or frame to prevent shifting, and even then may settle unevenly over time. Many swimming pool designs incorporate timber decking, as it is an attractive choice for pool surrounds and many varieties are available to fit any design. Wood is an especially great option to highlight a particular section of your surrounds (like a sun lounge area), as it adds warmth that is difficult to achieve with pavers or concrete. Timber is easy to work with and is often less expensive than other decking materials. Wood decking needs to drain well and especially if it’s shaded, needs to be regularly cleaned with a pressure washer to prevent slippery moss or fungus from growing. 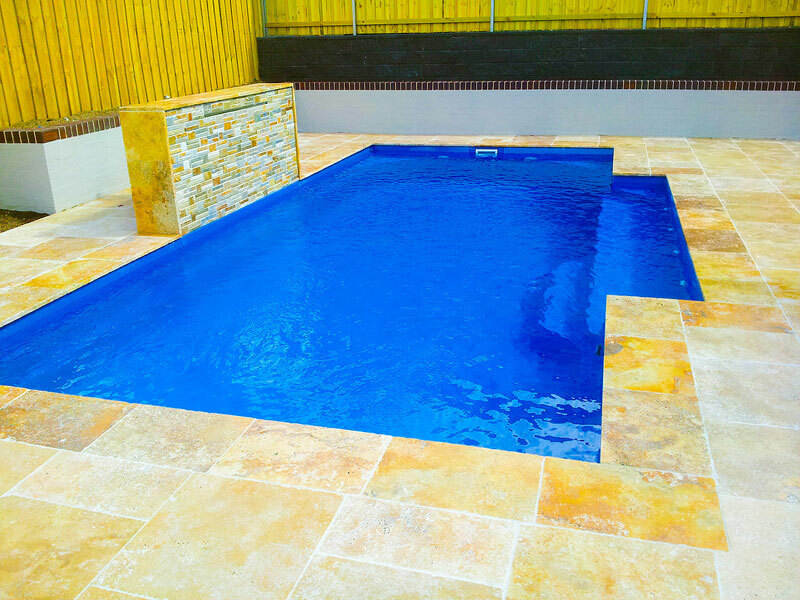 Note that if you plan to create your pool surround with a combination of pavers and timber, that timber with high tannin content (for example merbau) can cause staining on adjacent tiles. Two downsides to timber are that it is susceptible to rotting and splintering, especially if not maintained properly. If you like the look of timber but prefer a material that is less maintenance, composite decking is also a great option. Composite mimics the colour and grain of wood but is resistant to moss and fungus, insects, weathering, and fire. Other paving materials include tile and poured concrete. Glazed tile can become quite slippery when wet, so if you go this route be sure to choose unglazed terracotta or waterproof porcelain, which have more grip. Poured concrete works well for clean, contemporary designs; however, it can be prone to cracking. If you choose to use concrete in your pool design, be sure to select brushed concrete or a textured finish to prevent slipping.